Editor’s Note: In the next few months, we will be rolling out a series of blog posts announcing the new developments that will be released in FLOW-3D v11.1 and FLOW-3D Cast v4.1. Subscribe to the Flow Science blog to receive updates on developments such as Active Simulation Control, new Squeeze Pin and Mooring Lines models, an interface to add raster data to your simulations, decreases in runtime, and more straight to your inbox. What makes Active Simulation Control so powerful? 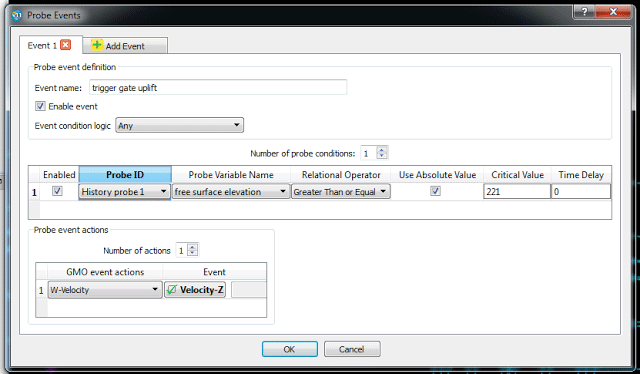 There are more options such as the choice of logic condition between multiple probe conditions. These logic extensions allow the user to accurately and efficiently simulate real-world design stages. Is this feature difficult to implement? FLOW-3D v11.1 allows user to intuitively use the new feature through its graphical users interface. Setting up Active Simulation Control involves a simple two-step process. What does the new feature look like? The Active Simulation Control window pops up from the Events tab (in red ellipse). This window shows one event that is triggered when History Probe 1 detects that the free-surface elevation is greater than or equal to 221. If that happens then the solver will impart a velocity to the chute gate without any time delay (instantaneous action). 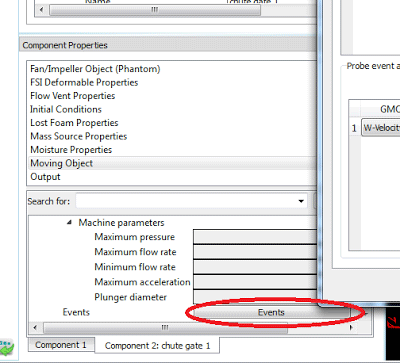 Event condition logic allows the user to choose if the action should be triggered when only one of the events happen or any or all. Yet again, very flexible. Is there a detailed example with results? The determination of when the plunger motion should be transitioned to a fast shot varies between different manufacturers but is generally based on a point in time when metal has arrived at all the gates. Active Simulation Control is a great tool for this purpose. In this example, this condition can be detected by placing history probes in the gates and detecting when the fluid fraction at all probes is greater than 0.5. Active Simulation Control automatically detects when transition to fast shot should occur and changes the plunger velocity without requiring the user to analyze the results, determine the appropriate time, and then restarting the simulation. In our example, an HPDC simulation of a pump cover is shown. The initial plunger motion is completed using the Barkhudarov method available in Utilities menu under Calculators, Shot Plunger Speed, to minimize air entrainment. Probes are defined in each of the four gates to monitor the arrival of metal. Once metal has reached all four gates, fast shot phase is automatically initiated. Another useful feature of Active Simulation Control is the ability to change the output frequency when the fast shot begins to capture the rapid filling sequence once the fast shot begins. In the animation above, three views of the filling are shown. In the lower left corner, the full geometry including the part, the runners and gates, and the shot sleeve are visible. A view of just the gates with the probes (red balls) is shown at the bottom. Plots at the top of the screen show the fraction of metal at the probes in the gates and the plunger velocity. Notice that the transition to fast shot automatically occurs when the metal reaches the gates as specified by Active Simulation Control. A time dial – a unique feature of FlowSight – is shown on the lower right. The dial is useful for indicating the progression of time during fast shot. Once the fast shot begins, the output rate becomes very fast.